In October 1997, I obtained a copy of my Great Grandfather's death certificate, it revealed that John Mulholland died on 1 December, 1951 at the age of 79. His parents were Robert Mulholland and Nancy Pertey (this was a name that was going to give me trouble for quite some time)...he was born and married to Elizabeth McWilliam, in Randlestoun, Northern Ireland (Randlestoun turned out to be Randalstown). It also revealed that John was a widower, which confirmed what I had understood from the stories my father told me, Dad had never mentioned his grandmother, and had always referred to his Grandfather as Puppy Mul. He would remember Puppy Mul and Uncle Geoff visiting when he was a child in Fairfield. Dad would say that he and his brother Paddy, would walk up to meet their grandfather and uncle when the train was due from the city. Puppy Mul and Uncle Geoff would bring a big bag of oranges for Dad's family when they would visit. The death certificate also revealed that William G 53 living and one male deceased (Dad's father) were his only issue. Some years later I would find that there was also an infant female that had died young. I don't recall exactly when I found this, but some time between December 2007 and June 2009 the Census of Ireland for 1901 & 1911 was made available online. It turned out that John was one of fourteen children. 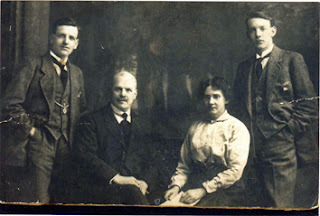 According to the 1911 Census of Ireland, household Form A, my Great Great Grandparents Robert and Nancy Mulholland, had been married 46 years; nine of their fourteen children were still alive, and one of their daughters Julia was also recorded on the census form with them. On 18 May, 1864, Robert Mulholland, aged 21 years, a labourer, of Aughaboy, Drummaul, son of John Mulholland, a labourer, married Nancy O'Neill, aged 18 years, of Ballytresna, Drummaul, daughter of James O'Neill, a shoemaker, in the Ballymena Registry Office. The marriage was witnessed by Eliza Macartney and Andrew Lamont. Aughaboy and Ballytresna were Townlands, located in close proximity to Ballymena and Randalstown.